Discussion in 'iPad General Discussions' started by Wakawaka, Feb 13, 2011. Thought I'd compare the two devices. I'm moving to TX this week, so thought I'd get this done with to see how the two compare! I have to say this is a great test..I have 3 signal bars on both devices! Both were done with at least two Cell tests, and one Wi-Fi test on a wireless G network. Both devices were placed in my office, on my mouse pad. Last photo is the area I live. 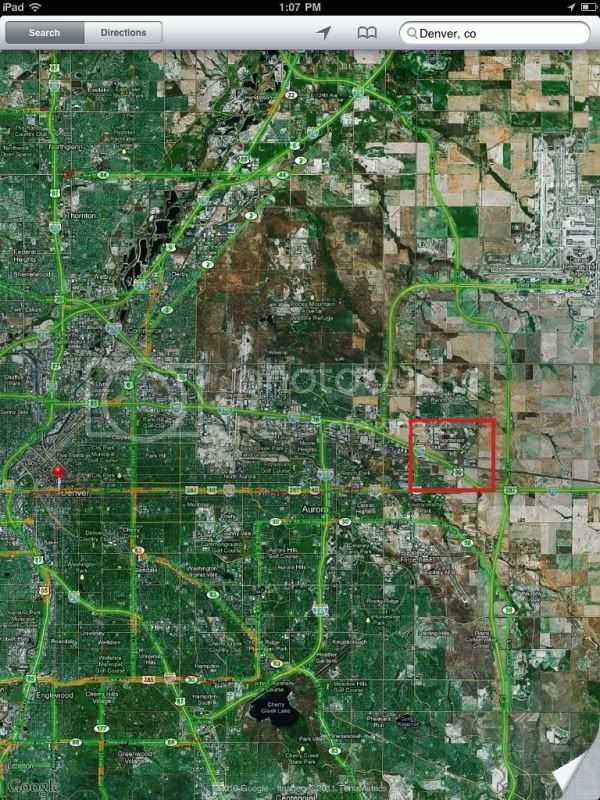 Roughly 15 miles from downtown Denver. What do you look for on speed tests? What kinda numbers are great? 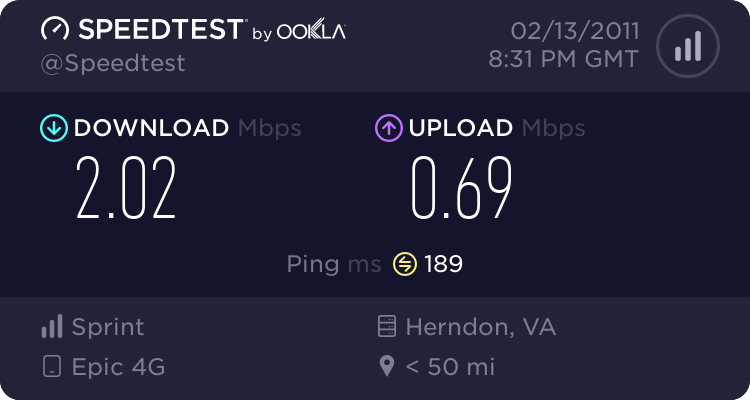 Apparently, Verizon caps out at around 3 or 3.5 MBPS download. AT&T caps out just under 8 MBPS download. I've been doing speed tests for new areas I travel to, to get REAL WORLD test results. Naturally, AT&T is going to do a marketing test and pick the best tower, and the best spot to gain their highest number possible. If they capture a true number, they can legally use it, marketing wise. For phone use.. I think a MB is good enough. 2-3 better. Anything higher, worthless on a phone. Unless you're downloading HUGE files..but again, it's a phone. I get roughly 1MB download when driving around/hanging out. My Facebook pages/comments load nearly instantly. Web surfing, pretty dang quick. As quick as my iPad in places that pulls higher DL numbers. Content is getting smaller. Placed content is not rising as fast as it's compressing. So for a device to recive the data, place it for your eyes to see.. it's a meer numbers game. A 500k image through a 2MB connection isn't going to download faster on a 10MB connection. Only if you have a 250k connection downloading a 500k image compared to a 10MB connection, will you notice a difference. Obviously I get much higher over 4g when I am in a 4g area. Those numbers from the OP have horrendous pings as well. What exactly do you mean by dependent advertised speeds? And in one area, I got 2.22mbps DL on my iPhone 4. 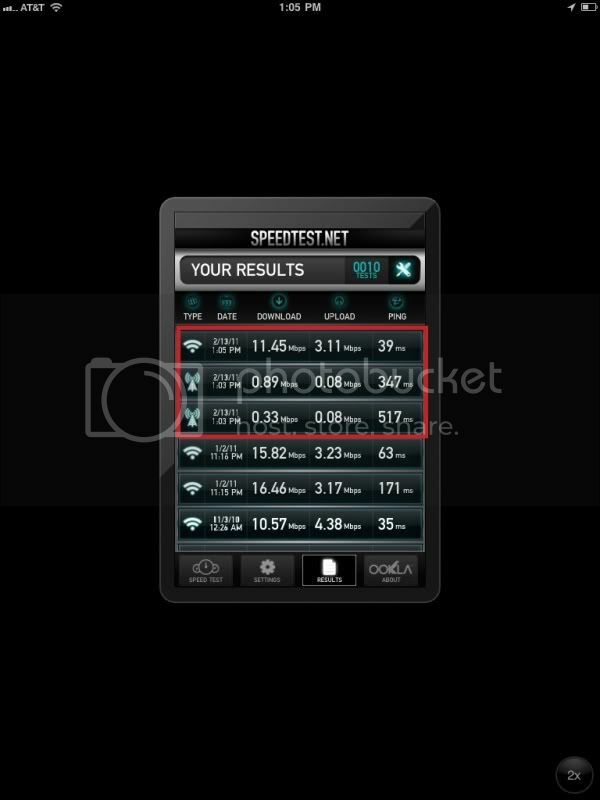 3G speeds will vary based on area, obstructions, and so on. I am talking about wifi. 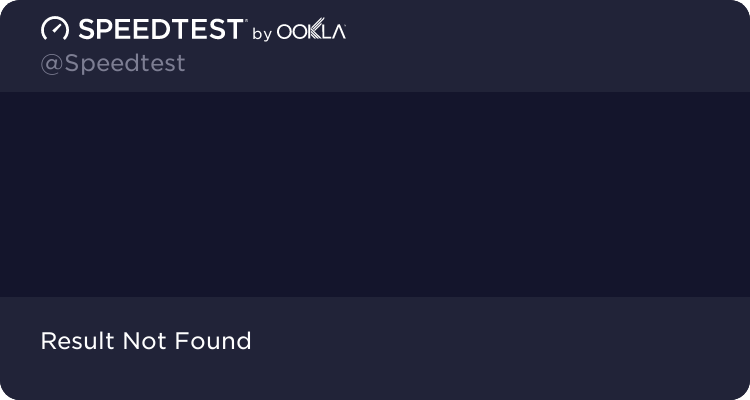 If you have a DSL connection, then if you are hitting 1.5mbps down over wifi on that DSL connection, then that is pretty good. If you have a Fiber connection like I do, then those same speeds would be absolutely horrendous. I have a 30/30 fiber connection, so my network maxes out the speed that the iPad can reach. Ahh yeah I see what you're saying. At my apartment, I was paying for Comcasts 10MBPS package, but constantly got at least 28mbps DL speeds. Didn't have my iPad at the time (two years ago). What does the iPad cap out at?? 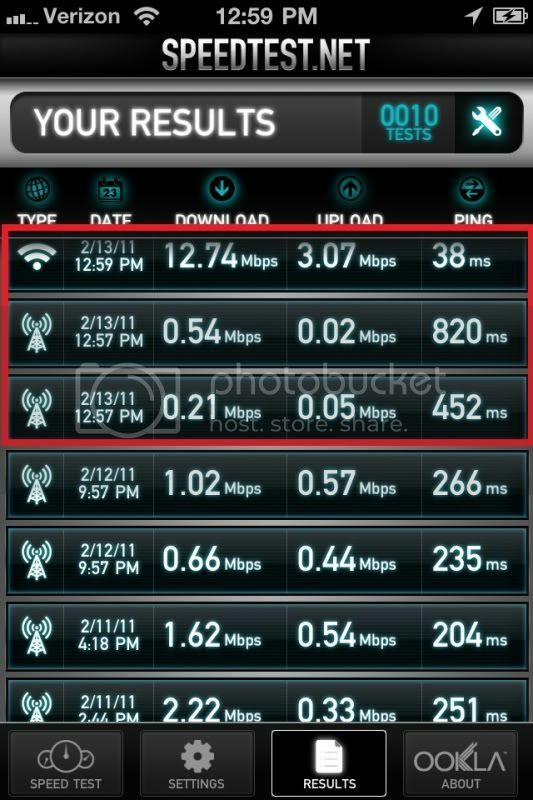 I would say the fastest the iPad could do would be 20 down and 20 up. Fastest I have ever gotten was 18 down / 17 up. Ok so I just got a 1.00 download Mbps and 0.35 upload.....how do you u get better signal? And does changing the server do anything on the test?